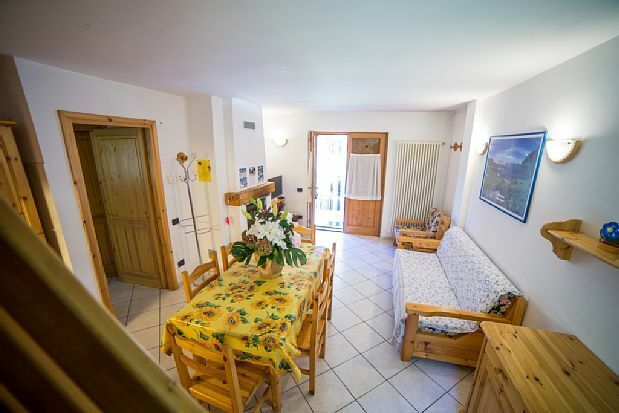 The apartment is around 70 meters for up to 9 people on 2 floors (ground and first floor) provided with living-room, kitchen, 3 bedrooms, 2 bathrooms and private underground parking place and cellar ski-box. There is a private balcony. The living room has a sofa, plus a dining table and chairs. There is a TV with Sky decoder and satellite channels. The kitchen is well equipped with an oven and hob, fridge freezer, dishwasher, fireplace and all the cutlery and crockery you will need for your stay. Pets are welcome. The apartment shares a big garden. Antey St. Andrè is placed between St. Vincent and Cervinia, 10 minutes by car from St. Vincent and 15 minutes from Cervinia. Moreover, it is distant about 20 minutes by car from Aoste, 35 minutes from Courmayeur and 45 minutes from Cogne. Near the apartment there is the Restaurant Pan et Vin, where it is possible, for the Guests, to obtain special conditions for continuative meals. Its also possible to take-away dishes as well. Near by the village you can find shops and services. The nearest Winter ski areas are Chamois (5 minutes by car), Torgnon (10 minutes by car), Valtournenche (15 minutes by car) and Cervinia (20 minutes by car). In the DueElle sport shop, placed in front of the AGIP petrol station, you can rent ski and all ski-equipment even in summer season, where you can ski on the glaciers of Plateau Rosà, above Cervinia, from 3500 m to 4050 m and the in winter from Plateau Rosà to Cervinia or Zermatt. Inside the same shop, you can also buy the daily tickets (ski-pass) for the ski area of Cervinia without additional cost. Its also possible to rent mountain-bikes. A riding trail for adults and children is operative in summer, between firs and larches, called health route that in winter becomes a nordic ski trail. Its also possible to do launch paragliding and rafting. You can reach the village, by car, taking the motor road A5 Torino-Aosta and leaving it at the exit St. Vincent-Chatillon. Then you have to take the regional road to Cervinia and follow it for about 10 kilometers. By train you can arrive to the railway station of St. Vincent-Chatillon and then take the bus following the direction towards Cervinia.